Gift-giving is a basic human act. It is a basic act of primates. It is a basic behavior of many life forms. When we talk about Gifting in this way, think of it as something like the acts of Filling and Emptying. We celebrate - and have celebrated for thousands of years - harvests by great feasts where we FILL ourselves with food and drink and thank God for the increase. Similarly, we have performed rituals of fasting and denial where we Empty ourselves of food and drink and often other types of things, like giving up candy for Lent, or observing Ramadan. Gifting is a complex behavior, and the times of gift exchanging vary: in what was the Western Roman Empire the time became Christmas in December, while in the Eastern Byzantine and Greek portion it became St. Basil's Day in January. The gifting remains constant even though the trappings and surrounding of the exchange vary. The season itself and its history will color the festival of gifting. The Norse god Odin, who was usually depicted with a full white beard, had a festival at Midwinter, a season called Jol or Yule, and he was referred to as Jolnir, a Yule person. Midwinter was on or about the winter solstice at December 20-21, not in the "middle" of winter, the word mid here being used to mean "at", so the calendar was "at [the start of] winter" on the solstice. ("Mid" has more than the meaning of "middle"; for example, the "mid" in "midwife" means "with"). We have ancient feasts and ancient ideas and concepts; myths, poetries, and stories; images and imaginations and songs; and they all conspire - the ancient fellows of our fraternity of Mankind - to recall, experience, renew, and create anew the experience of the Yuletide. There is Sinterklaas, Father Christmas, and St. Nicholas who all have changed through time and report. Dicken's A Christmas Carol has had a profound effect, as well as the illustrations of Thomas Nast. The American Retail Goods industry started on the bandwagon in the 19th century and transformed the image as well as the nature of the holiday. Recently I was at a site where the morality of the story of Santa was debated: should parents tell the lie that Santa exists to their very young children since those children will eventually discover the falsehood? I do not think the tedious discussions need repetition. When children reach the age of the end of the willing suspension of disbelief, why not discover to them that Santa Claus is a dynamic and complex symbolic structure that sums up and extends the History of All Men and Women of Goodwill? It is merely a myth... but a myth of immense proportions! For is it not a fact that we live and die according to stories of magnificent proportions? We strive that these theme stories of our lives be great rather then paltry and mean. The story of the Christmas Season is a living and breathing symbolic creation. We have degraded it into commercialism, true, but we have also sung carols and spoken of the unstinting love of this descendant of St. Nicholas for good children. It is not a lie, rather it is an expression and summation of our secular desires for peace and harmony. Touch on the nature of Gifting as simply as saying it is a sign of love: our love for each other and God's love for us, freely given without expectation of return; freely and selflessly as Saint Nick gives his presents to all the world's children. For heaven's sake, do not destroy Santa! Extend him to encompass the virtues of the season! Let him take under his tabard that godly charity we already express by "Peace on Earth, Goodwill towards Men!" Say that in this Christmas myth, we speak of peace, love, and selfless gifting... do likewise, young people! People say that by emphasizing Santa Claus and the gifting we ignore the real meaning of Christmas. It is my opinion that we ignore the real meaning of Christmas for 364 days of the year, so why not ignore it for another day? There are needs which for some reason we cannot allow our religious figures to fill. I mean, Jesus cannot go around giving gifts to kids, as if games, toys, and iPhones were loaves and fishes! So give Santa a chance. Then there is the real problem of the true nature of Starbuck's coffee cups for Xmas 2015! It is midsummer here and it has been interesting to watch how our midwinter is also starting to take a much greater place in the calendar and christmas has moved into merely a day off and a children's thing for most of us secular types. I suspect that is because most traditional stuff is winter based and makes no sense to us here. 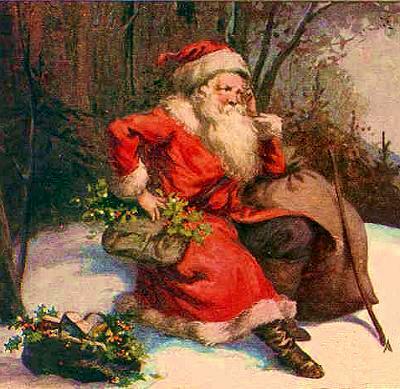 Maybe in a few generations Santa (or a new incarnation of him) may move to midwinter where the festival now is.